RANCHO MISSION VIEJO, CA--(Marketwired - Oct 8, 2015) - Homebuyers continue to spread the word about the recent unveiling of William Lyon Homes' Vireo and Aurora neighborhoods, making these new-home opportunities at Esencia one of the most sought-after in Rancho Mission Viejo. Hundreds of eager home shoppers attended the fun-filled event to enjoy festivities at The Canyon House, and explore the beautifully decorated model homes that showcased Aurora's charming garden court townhome designs and the elegantly appointed paired homes of Vireo's Gavilán 55+ crowd neighborhood. With Aurora's prices starting from just the high $400,000s and Vireo's homes priced from the high $500,000s, guests were instantly captivated by the residences' fresh architectural styles and well-appointed interiors; elevated settings with breathtaking foothill and ocean views; and the epic lifestyle advantages of the Village of Esencia setting that range from on-site school and farms to the Hilltop Club and open-air retreats. Those interested in learning more about these two must-see Esencia neighborhoods are encouraged to visit the sales galleries for model tours, or log on to their individual websites at www.LyonAurora.com or www.LyonVireo.com today. "Our dual Grand Opening event was planned to not only give guests an opportunity to experience the neighborhoods' beautiful home designs, but to also immerse them in the community-oriented Ranch-Life that embraces every life phase," said Lesley Pennington, Vice President of Sales for William Lyon Homes. "Visit today and find out why at Aurora and Vireo, all residents get exactly what they want." With an appealing array of designs crafted in Esencia's interpretive Farmhouse style and an enviable setting in one of Rancho Mission Viejo's most vibrant master-plans, Aurora and Vireo further William Lyon Homes' reputation for building the best homes in the most desirable locations. Aurora's garden court townhomes feature traditional Americana architecture with five well-appointed floorplans that comfortably suit a variety lifestyles and preferences. Home interiors span approximately 1,340 to 1,931 square feet with two to three bedrooms; two and one-half to three baths; spacious kitchens with Maytag® stainless steel appliances, granite countertops and white thermofoil raised-panel cabinetry; decks or patios per plan; and two-car attached garages. Residence Five includes a versatile den, while Residence One offers an optional wine bar. Vireo, Esencia's most attainably priced 55+ crowd Gavilán neighborhood, showcases three low-maintenance, single-level paired-home designs with optional second-floor den spaces and decks. Homes range from approximately 1,456 to 1,950 square feet with two bedrooms, two and one-half baths and two-car garages, as well as an elevated setting that offers spectacular coastal and backcountry views. Distinguishing the collection are design elements that include large great rooms and dining rooms; gourmet kitchens with granite countertops and white thermofoil raised panel cabinetry; spacious master bedrooms with walk-in closets; and private courts with private rear yards. Esencia on The Ranch is located just 2.3 miles from downtown San Juan Capistrano and five miles from San Clemente and Doheny State Beach, with easy access provided to the employment and retail centers of Ladera Ranch, Mission Viejo, Irvine, Rancho Santa Margarita and other Orange County areas. To learn more about Rancho Mission Viejo and Esencia, please visit www.RanchoMissionViejo.com. Rancho Mission Viejo, LLC is a privately held, family-owned and -operated company responsible for the ranching, farming, planning, development, and financial management of the remaining 23,000 acres of Rancho Mission Viejo, situated in unincorporated South Orange County, CA. Since 1882, members of the O'Neill/Avery/Moiso family have owned and managed The Ranch which once exceeded 200,000 acres and now includes the family-developed cities and communities of Ladera Ranch, Las Flores, Mission Viejo and Rancho Santa Margarita as well as such important places as Caspers Wilderness Regional Park, the Starr Ranch Audubon Sanctuary, O'Neill Regional Park and Marine Corps Base Camp Pendleton. To visit Aurora from I-5 south, exit for Ortega Highway/CA-74 and turn left. Turn left on Antonio Parkway, right on Cow Camp Road, left on Esencia Drive, right on Andaza Street, right on Tierno Road, then right again on Patria and follow the signs to the sales gallery. For more information, call 949.396.4488. To visit Vireo from I-5 south, exit for Ortega Highway/CA-74 and turn left. Turn left on Antonio Parkway, right on Cow Camp Road, left on Esencia Drive, left on Andaza Street, left on Fogata Street, then left again on Listo Street and follow the signs to the sales gallery. For more information, call 949.388.7401. Vireo offers low maintenance single-level home designs for the 55+ crowd. 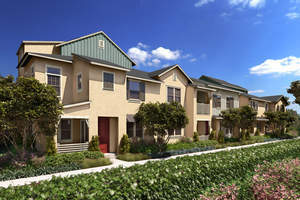 Aurora features brand new charming garden court townhomes.